When our customer bought their off grid house, they realised that living off the electricity grid would have its benefits – no bills! They approached Solar and Wind Applications for advice on how to alter the existing system to best suit their needs and aims for their home. With plans to use the house as a home office, as well as family home, the energy requirement is reasonably significant. A large part of the success (and joy!) of living off grid comes from a great understanding of where your energy comes from and how you manage your limited on demand resources. In discussion with our clients we suggested adoption of some alternative energy sources to optimise the system and provide the most reliable source of power. 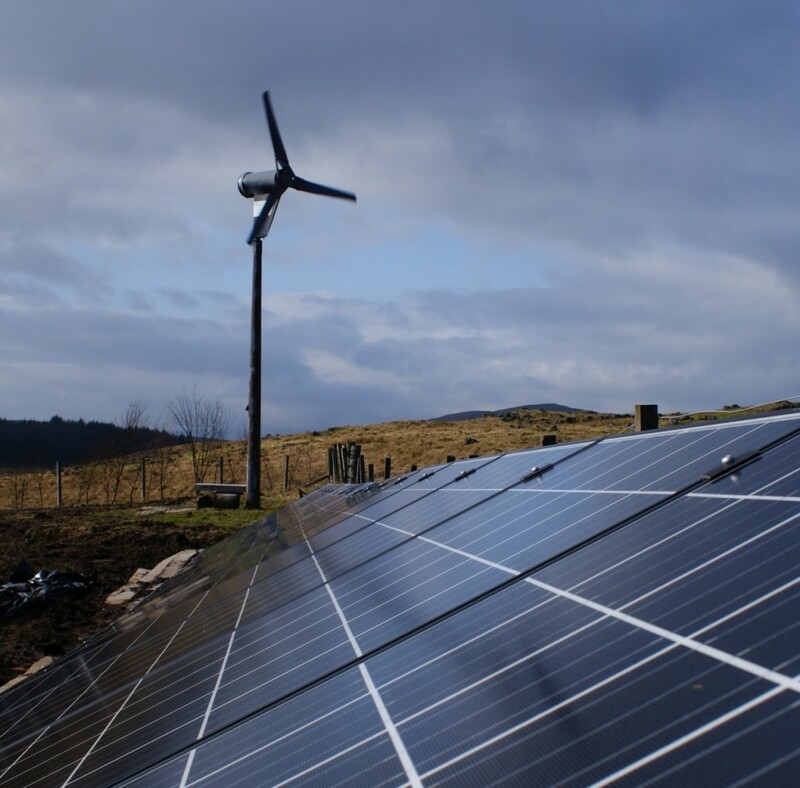 Originally, the site was supplied by power from a mix of an old Lister diesel generator supplemented from a Proven Energy 2.5kW wind turbine. The wind turbine fed a bank of batteries, and the power was managed by a Trace 3kW off grid inverter. This system appeared to be working adequately, however it quickly became apparent that the diesel consumption was much greater than expected… not to mention the noise of the generator when running. With a desire to reduce the diesel consumption, as well as provide extra power, we recommended the installation of some solar PV generation in addition to the wind. This generates a much more consistent feed of energy into the system, especially when paired with wind. 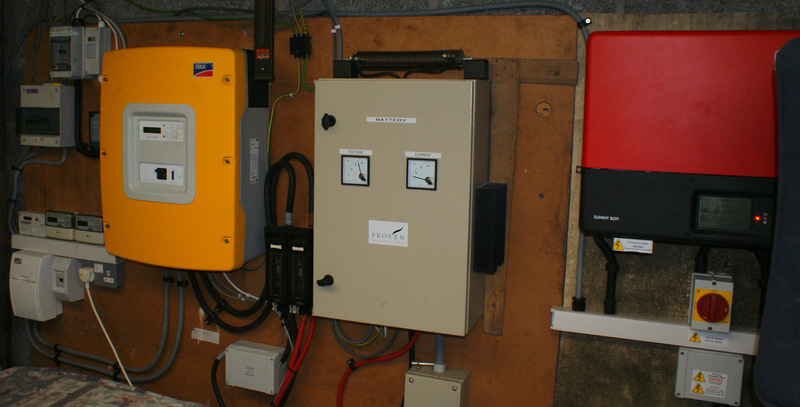 To enable our customer to claim the benefit of the feed in tariff, and ensure the system was brought up to a high standard and future-proofed, we replaced the Trace inverter for a slightly larger 5kW SMA Sunny Island inverter. The Sunny Island is very powerful piece of equipment that expertly manages the battery charging and discharging, which is vitally important to maximise the life of the costly batteries, and enables the feed in of the Solar PV. This means the Solar PV can be metered for the Feed in Tariff. The system also decreases battery losses for the daytime load in the home by prioritising solar generation directly to the loads, instead of via the battery bank. Following on from the initial installation of the Solar PV system, it was necessary to ensure that all of the generated power was being put to best use. Solar and Wind Applications took this on by designing a bespoke dump load and heating control system. This ensures the renewable generators are never wasting power, (or as happens in an off-grid situation – the Solar PV switches off to protect the batteries from overcharging!). The “excess” power is fed into the home to provide both heating and hot water through a thermal store using a substantial water tank. This tank is fitted with multiple immersion heaters of varying wattage to account for the variations in wind and PV generation throughout the day and seasons. The heated water is used to provide both on demand hot water via the taps and thermal transfer to the central heating system which includes a water filled underfloor heating system. 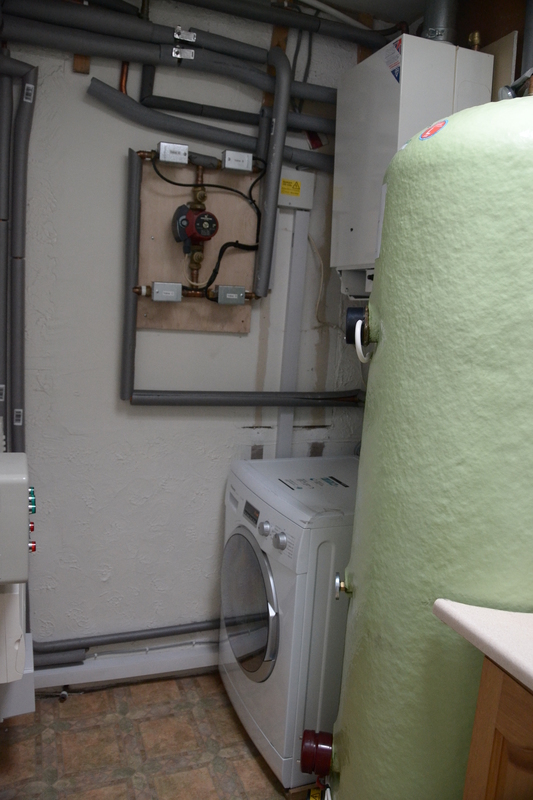 This additional installation offsets the cost and environmental impact of the on-site LPG supply for the existing boiler. Bespoke heating system including thermal store (tank) design, controllers and software. The heating controller is customer modifiable by use of their own PC. Our customer was able to carry out the ground works to our specification for the ground mounted Solar PV installation, including concrete pads and laying conduit for cabling. The system is now completely automated, with control over the home’s heating system. They are collecting feed in tariff for the Solar PV and rely much less upon the LPG boiler – for nine months of the year. The system reduces use of the diesel generator on site, saving a large amount of diesel. The generator only runs to feed into the batteries periodically to ensure they are kept in good condition over time. They also require significantly less LPG to heat their home… and often have the luxury of free heating when they would usually have heating turned off! We provided complete support for installing the complete system, from installation on site, design and installation of the plumbing system, software for the heating and generator start controllers as well as assistance and advice on signing up to the Feed in Tariff scheme. In addition we continue to provide post installation consultation and advice. As well as saving large amounts of diesel and LPG, the system provides clean and reliable power to fulfill our customer’s needs – both for home and home-office.